Vintage buttons rank right up there with vintage little people and red licorice in my world. While I had my own little stash of vintage buttons, I recently expanded it after deciding I need to make more of the button barrettes I made for gifts over Christmas (read about that here)--only this time, in keeping with my re-use philosophy, employing vintage buttons. (To be sold in little sets of three in my Etsy shop--at some point in the near future.) What with all those new vintage buttons, I had to find someplace to store and organize them. And that's when this gift from my father-in-law found its life purpose--it is a wooden jewelry box he gave to me over Christmas--beautifully crafted by him, of course. I just knew I would not use it for jewelry--but to use it for buttons? Well, vintage buttons are more like jewels to me than actual jewelry. It has a sectioned tray on top, and a hidden level of storage tucked beneath the tray--that lower level now houses my carded vintage buttons (because I cannot bear to uncard them until they are assigned to a new home and put to use)... ...and my little container of vintage buttons made of bone--yes, bone. Creepy, I know--but also, so cool (and I have never used them, by the way, but I do have big plans for them when the day comes ). 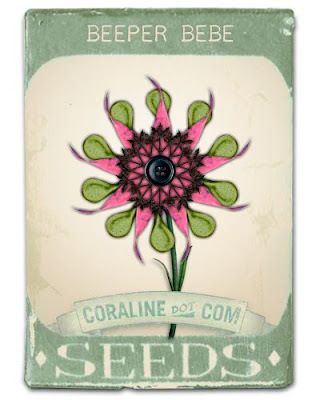 And speaking of creepy things that are also rocking my world--have you been to the Coraline website? The official one for the movie? It completely sucked me AND Beeper into immobility in front of the computer for about an hour and a half last night...full of haunting music and interactive graphics that allow you to take a tour through Coraline's world. 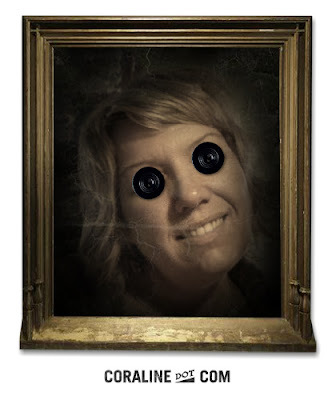 And then there are activities like the one above--where you can use your webcam to take a photo (or upload a photo from your computer, if you prefer) and then frame it in a gothic frame of choice and choose from a variety of vintage buttons for your eyes. I went with the standard black like the family in the movie--but you can pick much more ornate vintage varieties--and then download your image to your computer. 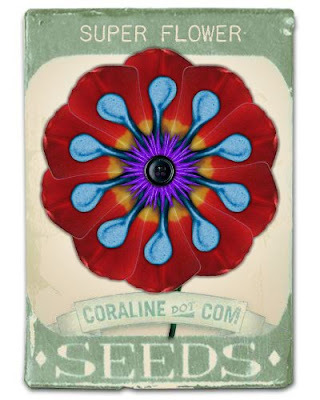 And also, you can visit Coraline's garden, and create your own button flower. Beeper engineered the Super Flower above (name by him, of course), and then downloaded a pack of the seeds to our computer afterward. That's my own Beeper Bebe variety below. Go see Coraline's world for yourself. There is a buttload more to do and explore--little movies to see, background about the making of the film, boxes to open, rooms to explore, evil button-eyed mothers to avoid...and yes, we will be at the movie this weekend. I understand your love of the buttons. I too have a love of vintage buttons, and have mine stashed in a variety of containers, and jars all over my work space. I think your use of the lovely jewelery box is perfect for storing all those buttons. Who needs jewels when you have them?